← Fantasy Studs & Duds, Week One. 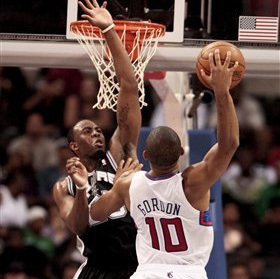 Poster of the Day 11/1/10: Eric Gordon on James Anderson. I’m not sure who was more explosive on this play, Gordon with the thunderous dunk, or Clipps commentator Ralph Lawler with his classic “OH ME OH MY!” exclaimation. I love Ralph Lawler, he just completely interrupts the sideline reporter, because after that dunk no one cared what she was yapping about anyway. Getting back on topic, what a dunk by Gordon. Usually when he dunks on people it’s a drive to the basket and he goes off one foot (like his dunk on Duncan last night). This is the first time I’ve ever seen him rise up off two feet and extend way back and hammer it down. I think this edges out Hakim Warrick on Paul Millsap for dunk of the year so far. Oh yeah, honorable mention to Omri Casspi.